How Many Hours a Day Do Puppies Sleep & What You Need to Do? How Many Hours A Day Do Puppies Sleep? When my husband and I were eagerly expecting the arrival of our son, we read books, researched the Internet, and spoke to experienced friends and family. We really prepared ourselves. When we brought our beautiful son home, however, we had no idea what we were doing. It all worked out, though. Through trial and error and with patience and humor, we eventually figured out how to properly feed, bathe, and play with him, and also when to nap and when to put him down for the night. Following a schedule made everything work smoothly, especially when I returned to work. In fact, following a routine made just about everything work successfully. We also taught him good sleeping habits and how to sleep through the night. When we later decided to add a puppy to the family, we again attempted to prepare ourselves. We read books, researched the Internet, and spoke to experienced friends and family. We wanted to know how to feed a puppy, bathe a puppy, and how many hours a day do puppies sleep. When we brought home our puppy, we expected to, again, have absolutely no idea what we were doing. But, something strange happened. We did know. We knew exactly what to expect. We knew exactly what to do. We had already gone through it all before. Our puppy was just another little infant and we simply had to treat him as such. Morning: as soon as we woke up, one of us took him out for a potty walk. Next, we fed him breakfast and then we took him out for another potty walk. Walks are brief at this age as his bones and joints are young and still growing. Then, it’s into his crate until the nanny arrives. Afternoon: the nanny will feed him lunch (he’ll eat three times a day until he’s six months, then two times a day) and take him for about two or three potty walks (he can hold his bladder about one hour every month he ages. For example, a six month old dog can hold his bladder six hours). He’ll go back into his crate in between walks and feedings, so the nanny can concentrate on caring for the human baby. Evening: my husband and I will let him out of the crate once we get home and right away take him for another walk. We’ll use this time for training and play. Bedtime: right before bed, we’ll go out for a last potty walk. Then, it’s back into the crate for the night. Our puppy’s day really wasn’t all that busy and eventful. He spent most of the day napping. So, how many hours a day do puppies sleep? Puppies sleep up to twenty hours a day. They need that much sleep in order to develop properly. As he sleeps, his muscles, immune system, and brain and nervous system mature. Just like humans, he needs sleep in order to grow well and must rest during growth spurts. And, like human children, he may be running around with boundless energy one minute, and within the next, he’s fallen fast sleep, right where he stood. Also, just like human children, if puppies don’t sleep enough; if they keep on going when they should be napping; and/or if they get overtired, over-exhausted, and over-stimulated, they can exhibit bad behavior. So, like our first baby, with regard to sleep, we taught our furry baby good sleeping habits and how to sleep through the night. Identify the place you want your puppy to nap and sleep during the night. It might be his crate, a bed, your bedroom, or wherever. Find a material or bedding that your puppy likes. It could be a dog bed, pillow, soft towels, or a blanket. He might prefer his crate, which you can place in a quiet place or your bedroom. You could put the bedding, pillow, towels, or blanket in the crate, along with some toys. Whenever your puppy seems sleepy, take him to his sleeping area. Don’t worry if it takes a little bit of time for him to understand. He eventually will. Don’t worry if he sometimes falls asleep somewhere else, though. It’s okay. Do whatever you can to avoid the desire to cuddle up to him and to also allow him to fall asleep in your lap. Doing so will only develop bad habits and make him dependent upon your presence to fall asleep. Such might be very difficult to break later on. Let your puppy nap without disruption. Don’t let family members or friends waken him and teach children to leave him be whenever he is sleeping. 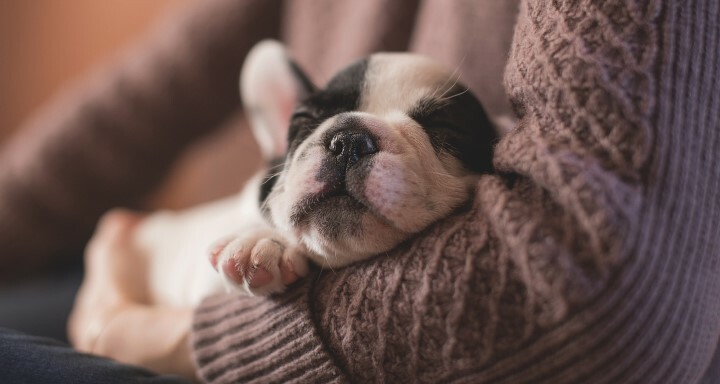 Like human babies (and human adults, for that matter), abrupt noises or continued sounds can interrupt a puppy’s nap, which can make him cranky and/or act out while awake. Important, also see *Do Dogs Dream? Keep the lights in his sleeping area dim and the sounds off. Such will encourage sleep and let him sleep soundly. A normal nap could last between thirty minutes to two hours. Take him for one last potty walk, direct him to his sleeping area, and turn off the lights. Such will cue him that it’s bedtime. If his sleeping area is in your bedroom and you like to watch television or listen to the radio, try to keep the lights low and sounds soft or do something unique that lets him know it’s definitely bedtime. Don’t be concerned if he barks or whines before settling in. Such is common. Like your human baby, a puppy seldom sleeps straight through the night and might need to go outside for a potty walk during the night. He might not be able to sleep straight through the night until he’s four months old. Accidents are common for puppies that are still growing and acquiring muscle and that includes the muscles that control bladder function. If your puppy has regular accidents, restrict his water intake before bedtime and make extra sure you take him out for that last potty walk. You should never be concerned if your puppy seems to be sleeping all day. Again, he needs to sleep. You would be concerned only if, after sleeping up to twenty hours a day, he seems sluggish when awake. If that is your situation, check his mouth and gums. If his gums are greyish-white or pale, he could be anemic. Anemia is a blood-related condition that depletes oxygen and energy. See your veterinarian for further evaluation. When he matures into an adult, he’ll still sleep a lot, up to fourteen hours a day. That means, he’ll nap up to six hours during the day and sleep for eight hours during the night. Dogs like to sleep! The Rapid Eye Movement or REM stage of sleep is the stage in which we humans dream. We spend roughly twenty-five percent of our sleeping time in REM sleep. We are difficult to awaken during that time. Dogs/puppies spend about ten percent of their sleep in REM sleep. They, too, are difficult to awaken during that time. If disturbed, they might be grumpy. They may even bite. This is why it is important to teach people, especially children, not to disturb a sleeping dog/puppy (dog, from now on). Take the expression “let sleeping dogs lie” literally. You may be able to see a dreaming dog’s eye’s move during REM sleep. He may bark or whine, his facial muscles may spasm, and he may “run” in his sleep. Scientists theorize that they are dreaming that they are chasing a rabbit, cat, or squirrel. Your dog/puppy’s sleep position reveals interesting details about his personality and sleep pattern. Side Sleepers: dogs/puppies who sleep on their sides feel safe, comfortable, and trust their owners. Back Sleepers: dogs that sleep on their backs with their legs up are exposed and vulnerable. Only the dog that feels safe and secure would ever choose to sleep in this position. Curled-up Sleepers: wolves passed down this sleeping position, so it is the most common. It helps dogs/puppies (dogs, from now on) keep themselves warm and also defend their face, throat, limbs, and organs. Should they need, they can leap up to their feet right away. Calm, relaxed dogs often sleep this way. Stomach Sleepers: dogs that sleep on their stomachs with their legs spread out look as though they are in flight. This position, too, makes it easy for a dog to leap to their feet. High energy dogs often sleep this way. Propped Up Sleepers: Brachycephalic dogs sleep propped up or standing. Such dogs are “flat headed” (e.g. pug, bulldog, boxer). With time and patience, you and your babies, both furry and non-furry, can establish good, healthy sleep habits and wonderful, sweet dreams. Best-dog-guide.com is a participant in the Amazon Services LLC Associates Program, an affiliate advertising program designed to provide a means for us to earn fees by linking to Amazon.com and affiliated sites. We may get a commission through the purchases you make through our links at no additional cost to you. Best Dog Guide - We are Dog's Best Friend - All rights reserved.